If you didn’t live through the junk bond scandal of the mid-80’s you may need a primer before seeing Junk. Though much unfolds through the plot, it’s still a bit complex as to how they committed such monumental financial chicanery in plain sight. The drama centers around the period when hostile corporate takeovers by young high-flying Wall Street players gamed the system to turn debt into dollars in order to line their pockets. They made some people money, but ultimately it was a Ponzi scheme that took down our financial system, robbed tens of thousands of workers out of their jobs and retirement benefits, and pretty much destroyed American manufacturing. The story mirrors the rise and fall of Michael Milkin the junk bond king. 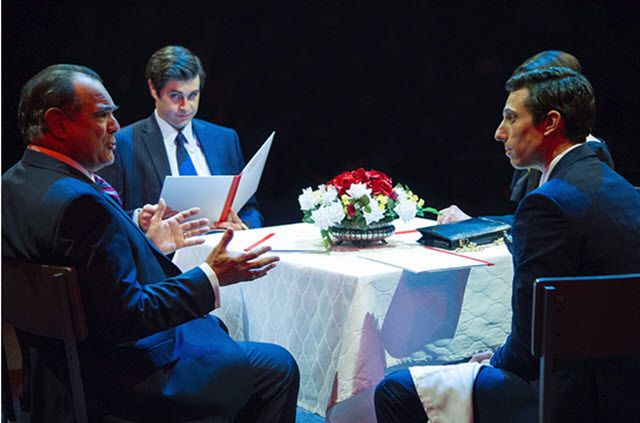 (L to R) Edward Gero (Thomas Everson Jr.), Thomas Keegan (Robert Merkin) and Jonathan David Martin (Israel Peterman). Photo by C. Stanley Photography. Nancy Sun (Judy Chen). Photo by C. Stanley Photography. 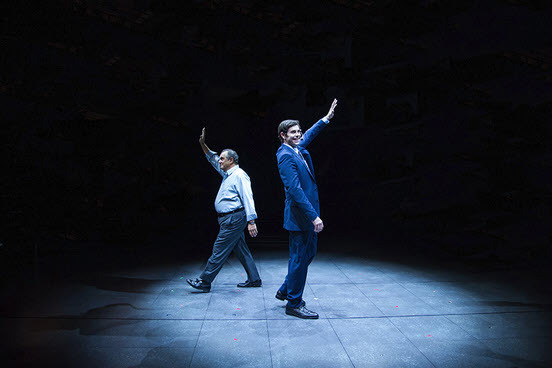 Pulitzer-winning playwright, Ayad Akhtar (Disgraced) draws us into this sleazy, greedy, nether world of characters with warning lights flashing while investors reaped untold millions through mergers and acquisitions as companies tanked. It’s fascinating and revealing, all at once – a cautionary tale of greed and deception. 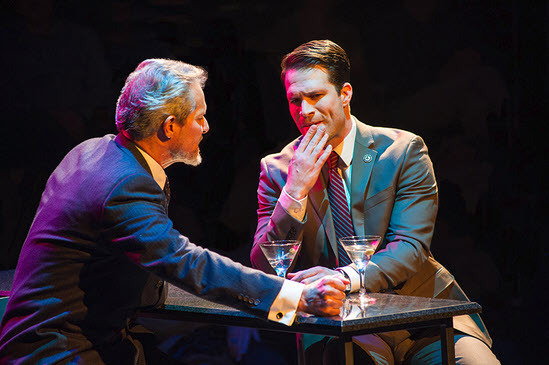 (L to R) Edward Gero (Thomas Everson Jr.) and Thomas Keegan (Robert Merkin) in Junk. Photo by C. Stanley Photography. Thomas Keegan plays Robert “Bob” Merkin, a. k. a. “the White Whale”, who Time Magazine named “America’s Alchemist”. Keegan is riveting as the kingpin of the bond market and the titan who everyone fears and obeys. His plan is to take over a three-generation-owned American steel manufacturer run by Tom Everson, Jr. However, there are subplots that lurk beneath the surface. Judy Chen is writing a book on the Merkin phenomenon and switches sides, Murray is an investor whose wife is suspicious of Merkin’s shady deals, Boris Pronsky works behind the scenes as an unscrupulous trader in debt to Bob, and Israel Peterman is Bob’s front man. Oh, and there’s a mole. I won’t say who. That ought to get you started. 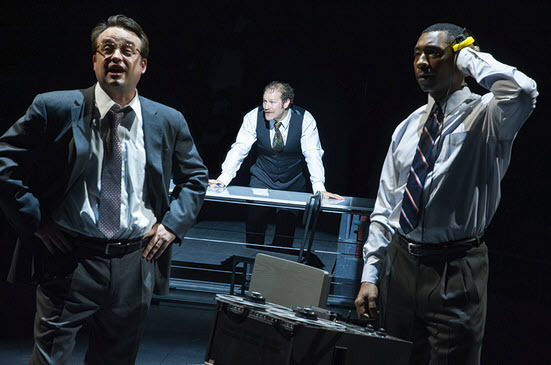 (L to R) Michael Glenn (Mark O’Hare), Elan Zafir (Boris Pronsky) and JaBen Early (Kevin Walsh/Curt) in Junk. Photo by C. Stanley Photography. For Bob who thinks “debt signifies new beginnings,” he believes, “the law belongs to those who break the rules.” When he finally gets his comeuppance for a host of felonies laced with triple damages, and everyone starts ratting each other out, we begin to see the inkling of an idea forming in Bob’s mind for his next racket – the mortgage crisis that sent the country into a tailspin. But there are lots more twists and turns to keep you guessing who will come out on top. 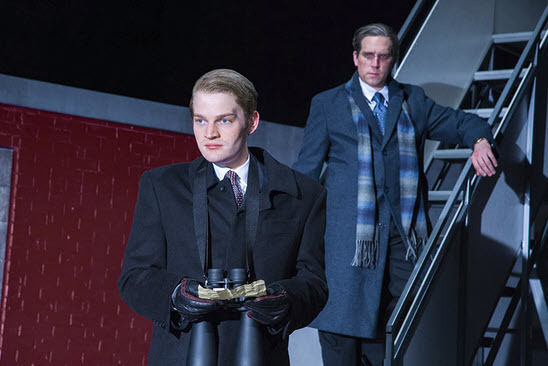 (L to R) David Andrew Macdonald (Leo Tresler) and Nicholas Baroudi (Giuseppe Addesso) in Junk. Photo by C. Stanley Photography. Clever, intense and a forewarning. Highly recommended. 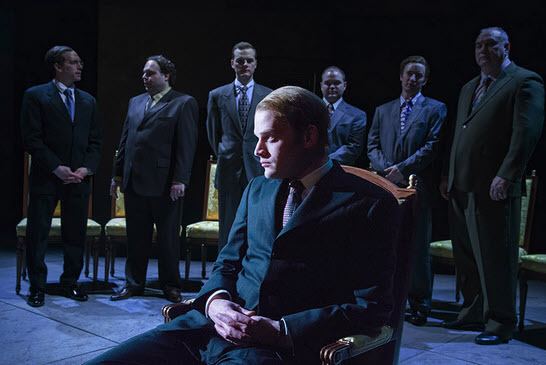 Starring Thomas Keegan as Robert Merkin; Nancy Sun as Judy Chen; Edward Gero as Thomas Everson, Jr.; Jonathan David Martin as Israel Peterman; David Andrew Macdonald as Leo Tresler; Shanara Gabrielle as Amy Merkin; Michael Russotto as Murray Lefkowitz/Maître d’/Counsel; Elan Zafir as Boris Pronsky; Amanda Forstrom as Charlene Stewart/Lawyer; Jaben Early as Kevin Walsh; Kashayna Johnson as Jacqueline Blount; Lise Bruneau as Maximilien Cizik; Perry Young as Raúl Rivera; Michael Glenn as Mark O’Hare/Curt; Dylan Jackson as Devon Atkins/Waiter; Nicholas Baroudi as Giuseppe Addesso; and Elliott Bales as Union Rep/Corrigan Wiley/Fight Captain. 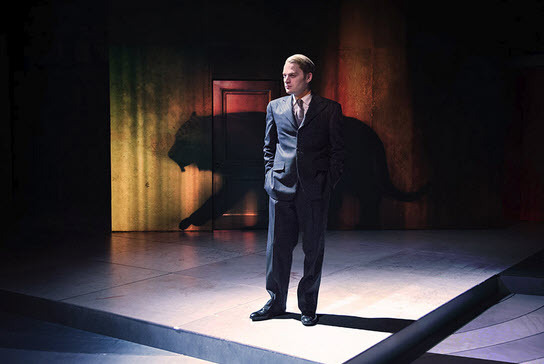 Directed by Jackie Maxwell; Set Design by Misha Kachman; Costume Design by Judith Bowden. Through May 5th at Arena Stage in the Fichandler Theater – 1101 Sixth St., SE, Washington, DC 20024. For tickets and information call 202 488-3300. Fans of Henry James will cotton to this period piece that debuted on Broadway in 1947. (L-R) Laura C. Harris (Catherine Sloper) and Jonathan David Martin (Morris Townsend) in The Heiress. Photo by C. Stanley Photography. Set in the Victorian era, it is based on James’ novella, Washington Square. The Heiress takes place in the parlor of the prominent Doctor Sloper’s home in New York City circa 1850’s – a time when proper ladies and gentlemen of a certain class comported themselves with the utmost dignity. But minding your P’s and Q’s at a time when a family’s reputation could be destroyed at the drop of a lace handkerchief, took serious adherence to well-circumscribed proprieties. For the painfully shy doctor’s daughter, who struggles to live up to her late mother’s image in her father’s eyes, every social interaction is torturous. Every slight from her father’s lips remands her deeper into her silent world of embroidery until his sister, Lavinia, encourages Catherine to climb out of her self-imposed shell and reject his autocratic demands. 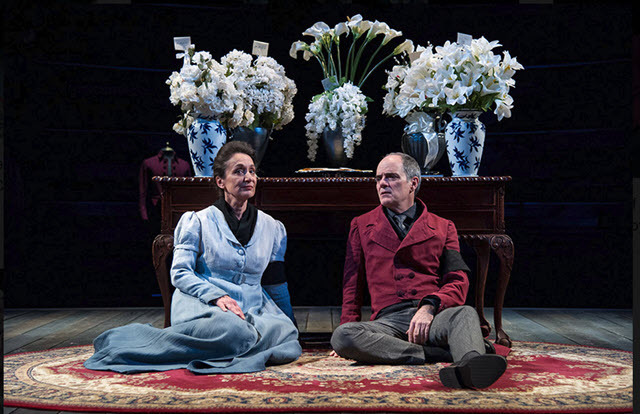 (L to R) Janet Hayatshahi (Elizabeth Almond) and James Whalen (Dr. Austin Sloper) in The Heiress. Photo by C. Stanley Photography. 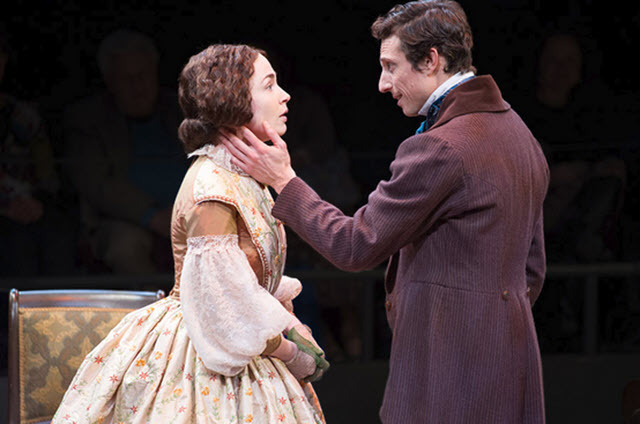 When a cousin brings Morris, an attentive young suitor, to dinner Catherine begins to see how the attentions of an adoring young man can empower her to speak out. 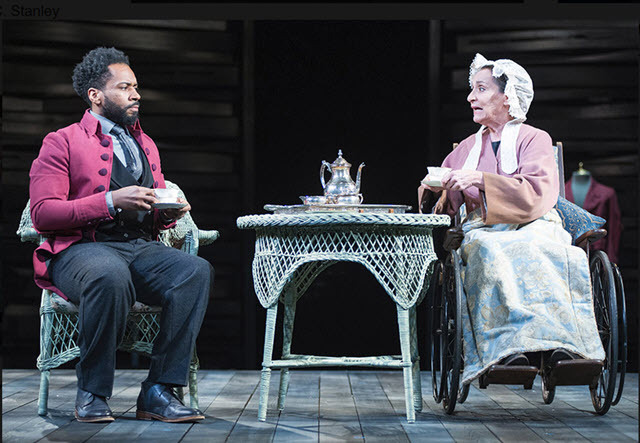 Naturally, her father disapproves as Morris is penniless, but Catherine finds her inner strength and, with the backing of her aunt, rebels against his social constraints. 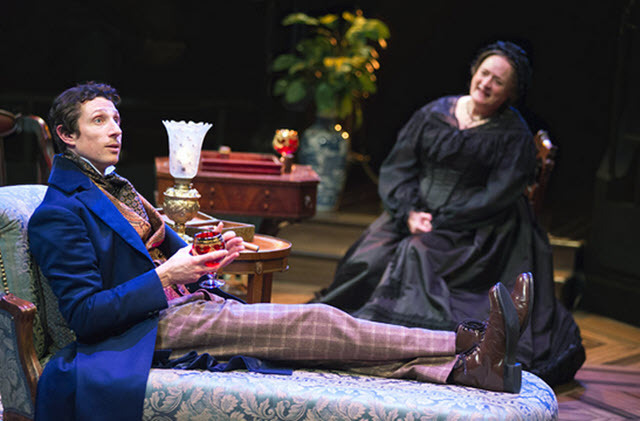 Relatives provide disparaging gossip about Morris that he is a mere mountebank after Catherine’s fortune and the money her father has promised to leave her in his will. It’s easy to imagine how fraught these issues must have been when young women bowed to the demands of their fathers and society’s pressures to conform to the highest standards of conduct were unassailable. 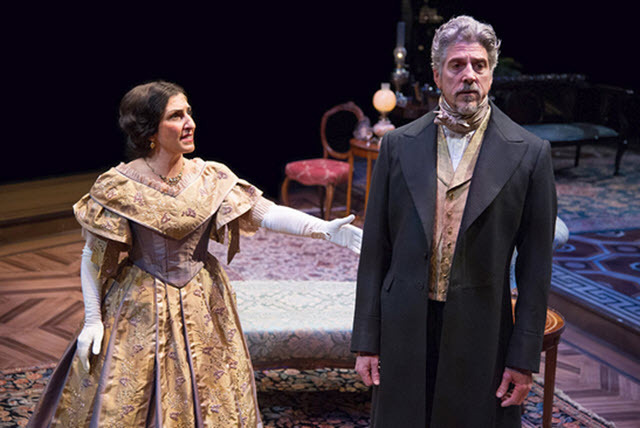 (L-R) Jonathan David Martin (Morris Townsend) and Nancy Robinette (Lavinia Penniman) in The Heiress. Photo by C. Stanley Photography. The great character actress Nancy Robinette as Aunt Lavinia is marvelous, as is Laura Harris as Catherine and Jonathan David Martin as the suspiciously-motivated Morris. It’s a well-balanced cast all around with an all-women creative team that includes Deputy Artistic Director Seema Sueko. Together they produce the precise ambiance to frame this classic period piece which draws upon women’s struggles to supersede their societal constraints. Fans of period dramas such as Downton Abbey will swoon. By Ruth Goetz and Augustus Goetz; Directed by Seema Sueko; Set Design by Mikiko Suzuki Macadams; Costume Design by Ivania Stack; Lighting Design by Sherrice Mojgani; Sound Design and Original Music by Emma M. Wilk; and Wig Design by Anne Nesmith. With Lise Bruneau as Mrs. Montgomery; Lorene Chesley as Marian Almond; Laura C. Harris as Catherine Sloper; Janet Hayatshahi as Elizabeth Almond; Joanathan David Martin as Morris Townsend; Nanacy Robinette as Lavinia Penniman; Kimberly Schraf as Maria; James Whelan as Dr. Austin Sloper; and Nathan Whitmer as Arthur Townsend. 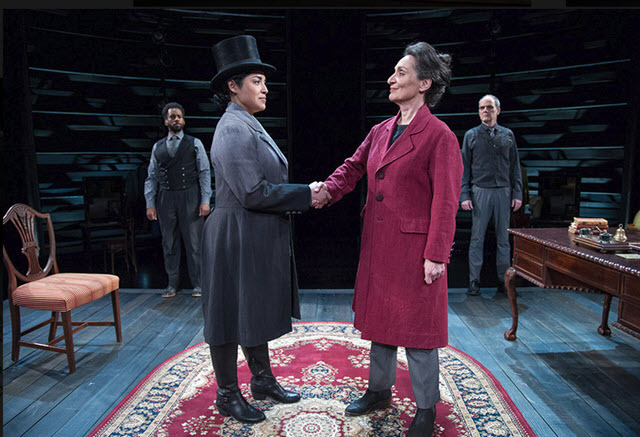 Through March 10th at Arena Stage – 1101 Sixth St., SE, Washington, DC 20024. For tickets and information call 202 488-3300 or visit www.ArenaStage.org. 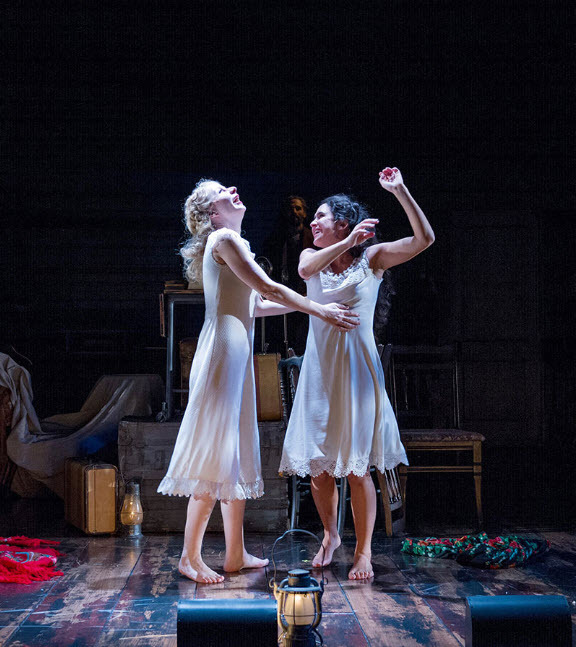 Paula Vogel’s Indecent is not your typical holiday entertainment. It’s dark and foreboding. Opening during the season of Hanukkah, it strikes one as an unusual period to put on a tale about the travails of a group of Polish Jewish actors who meet a terrible end in Nazi Poland. Vogel’s play arose out of her interest in the misinterpretation of Sholem Asch’s play God of Vengeance written in 1907. 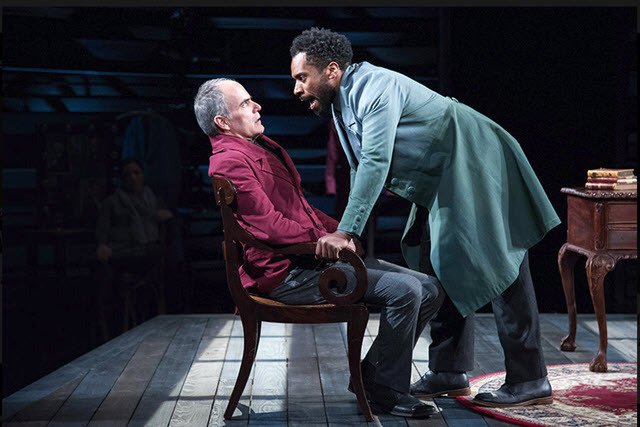 It attempts to revisit that play and its impact and separate the two from Asch’s original intent – what he truly meant to express and how devastated he was when critics and rabbis disapproved of it. 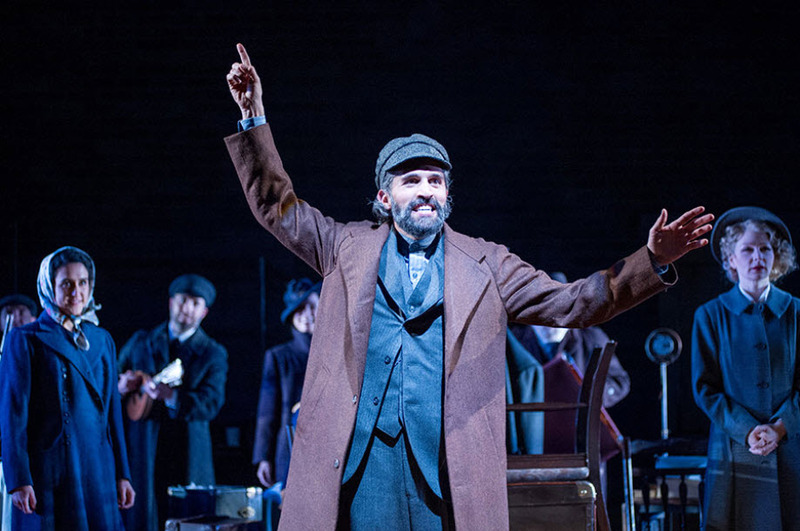 As a period, Yiddish play, written during the heyday of Yiddish theater, Asch was devasted when his play augured the demise of that beloved form of entertainment. (L-R) Susan Lynskey (The Middle: Halina/Ensemble) and Emily Shackelford (The Ingenue: Chana/Ensemble), with Ben Cherry (Lemml) in background. Photo by C. Stanley Photography. We meet the young Sholem and his wife in their bedroom. She is reading his first play and encourages him to produce it. “It’s wonderful! It’s so sad,” she tells him. He presents it in a private salon for playwrights at the home of a producer who agrees to stage it. Others in attendance see it as degrading to Jews because it has racy scenes. It was later to become a play so reviled by American Jews because it dared to present them as human with all its messy faults and foibles. Nonetheless, one man, Lemml, a modest tailor, endorses Asch’s craft and becomes the play’s stage manager. Over the years God of Vengeance is performed throughout Europe and Russia to great acclaim, though the unusual story of a Jewish brothel owner, the trashing of the Torah and a romance between two women, portrays Jews as less than holy. When the actors go to America in 1921, the play is censored. The original Asch play opened on Broadway in 1923 and featured the first kiss by two women on the Broadway stage. This innocent and playful scene has the women dancing in the rain as they celebrate their love. The upshot was that the entire troupe was arrested for obscenity, later resulting in an investigation of the playwright by the House Un-American Activities Committee. Ben Cherry (Lemml) and the cast of Indecent. Photo by C. Stanley Photography. Violin, clarinet, accordion, and what appeared to be a balalaika, serve as a mournful background to the destruction of the socialists’ high ideals. Well-acted, it reflects a turbulent time during the days of politically-motivated censorship of those in the arts. With Ben Cherry as The Stage Manager: Lemml; Susan Lynskey as The Middle: Halina/Ensemble; John Milosich as Moriz Godowsky/Musician/Ensemble; Victor Raider-Wexler as The Elder: Otto/Ensemble; Susan Rome as The Elder: Vera/Ensemble; Emily Shackelford as The Ingénue: Chana/Ensemble/Dance Captain; Maryn Shaw as Nelly Friedman/Musician/Ensemble; Alexander Sovronsky as Mayer Balsam/Musician/Ensemble; Ethan Watermaier as The Middle: Mendel/Ensemble; and Max Wolkowitz as The Ingénue: Avram/Ensemble. 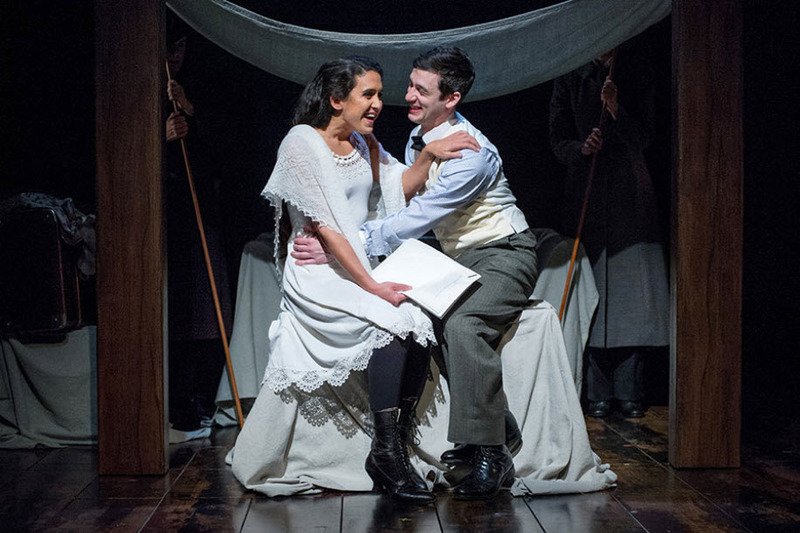 (L-R) Emily Shackelford (The Ingenue: Chana/Ensemble) and Max Wolkowitz (The Ingenue: Avram/Ensemble) in Indecent. Photo by C. Stanley Photography. Diercted by Eric Rosen; Choreography by Erika Chong Shuch; Music Direction and Original Music by Alexander Sovronsky; Set Design by Jack Magaw; Costume Design by Linda Roethke; and Lighting Design by Josh Epstein. Through December 30th at Arena Stage – 1101 Sixth St., SE, Washington, DC 20024. For tickets and information call 202 488-3300 or visit www.ArenaStage.org.